James has more than thirty-four years’ experience as an Auctioneer and Valuer. 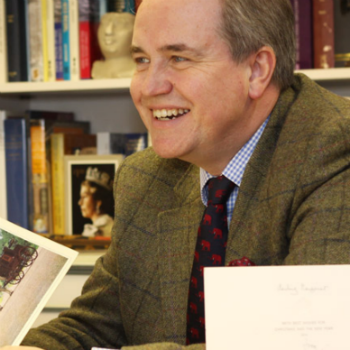 His extensive general knowledge covers a variety of subjects including Royal memorabilia, furniture, Oriental ceramics, weapons, militaria and classic cars. James regularly gives talks and writes articles on antiques. He has been a specialist advisor on BBC Radio Essex and an expert valuer for the BBC ‘Flog It’ programme. “I was passionate about antiques from an early age, having grown up with a grandmother who loved collecting and instilled in me a sense of history and appreciation of the past. I collected militaria as a schoolboy and at the age of fifteen, managed to get my first school holiday job at Sotheby’s, Belgravia, which spurred me on to become a porter and trainee auctioneer with Paskell & Cann when I left school at the age of sixteen. In the same year, I won the London heat of the National Auction Competition held at Bonhams and have always enjoyed being on the rostrum. Sometimes it feels like a piece of theatre, with the auctioneer drawing that elusive extra bid just by using a few well-chosen phrases to spur on the bidders, who had every intention of stopping several bids previously. My best result was a client who came into the saleroom for a barometer and left with an Aston Martin – although I think he was a little terrified to tell his wife! I have seen a lot of changes in the auction profession but the internet has had the most beneficial effect. Whilst we may only have one hundred or so people in the room, we often have between five hundred to seven hundred people bidding live on-line from all over the World, which allows us to achieve some spectacular results for our clients. One of the most memorable sales for me was the William Tallon Collection. William worked for The Royal Family, in particular The Queen Mother, for over fifty years and during that time amassed an amazing collection of art, Royal Presentation gifts, letters, cards and other Royal ephemera. It took me three months to catalogue the collection which proved very worthwhile, as we sold it for £440,000 to bidders from all over the World.